My Story, by Amy H.
I am Gay. It is as simple as that. 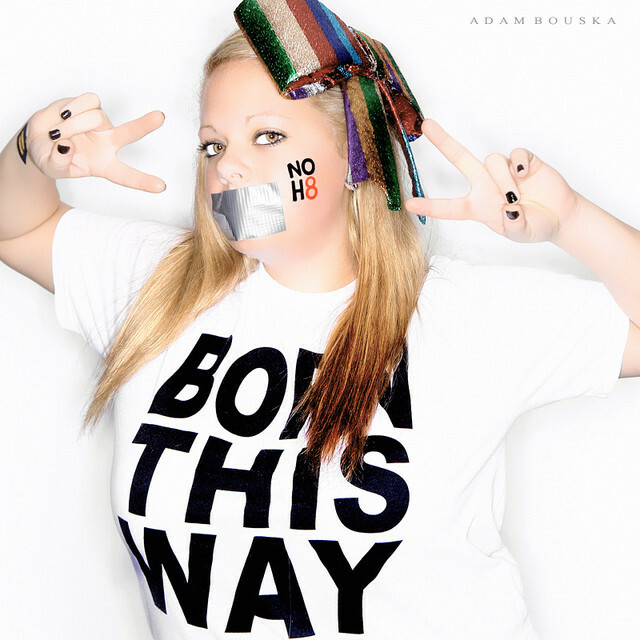 I posed for the NOH8 Campaign as a way to express myself without words. I guess I am tired of explaining. Tired of people trying to figure “it” out. Growing up in a very strict catholic house hold, “it” was not something talked about. “It” was not expectable. Since my voice has been silenced thanks to homophobic people and a complete lack of understanding, I will wear my pride on my face. I will let the tape be a symbol of a quiet voice, a voice silenced by judgment, and fear. I will let the tattoo speak for itself, and my eyes will remain passionate and hopeful that one day “it” will be ok. NOH8.